What are the courses needed to start an appliance service business? Education starts in small increments. 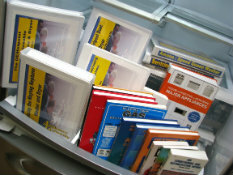 Library ABC - 34 Videos Appliances & Refrigeration Tutorials will kick start that knowledge and education. Experience will be gained over time, and is the job of the student. Not everything a technician needs to know will be in the courses or DVD tutorials. Those experienced in the appliance business know that this would be impossible to create and provide. See: Introduction to Appliance Repair Education, Career Guide for Home Appliance Repairman, With Training Requirements Information. What is the difference between the libraries & bundles? Simply, it is more or less DVDs included in the bundle. Click on selected libraries below. What is the "Appliance Business Opportunities" catagory? The same as the libraries; the difference is more or less, how the videos are combined with other instruction to start up an appliance or HVAC/R service business with more instructions. These bundles include libraries above. Does Appliance University have Vocational Courses? What does and doesn't Vocation Courses provide? Not everything every technician needs to know is in the courses. Those of us with experience in the appliance business know that would be impossible to create and provide. These course start your education, what the courses does provide is a solid foundation that will give you an opportunity to build your skills as an appliance service professional and earn a certificate of completion from Technical Training Associates, a quality training organization that’s been offering adult education programs in partnership with the community college system since 1985. Jim Say, "The course is designed and delivered to you in a way that helps you succeed. That doesn’t mean that the program is easy and you can “slide” through. I wouldn’t be doing you any favors if I designed a program everybody could accomplish without effort. I’m very stubborn about that. When you hang your certificate of completion on the wall, you want to know that the institution granting it has high standards and wants to maintain credibility so your certificate is worth something. We’ll test your mettle, to be sure, but we’ll also be with you every step of the way until you complete all 5 program modules. Another thing I’m stubborn about is requiring all our program participants, no matter how long they’ve been in the business, to complete all modules in the same sequence as someone new to the appliance industry. We only grant certificates to technicians who successfully complete our entire program." What does ths mean "each UNIT PRE-REQUISITE MUST BE TAKEN"? Each module unit most be taken in SERIES of units #1-5 and test sendin to be evaluated making sure the student comprehends the unit, than proceed to the unit. Appliance University program is designed to provide a training component and a certification that attests to the professionalism and competency of the technician who completes it. The program is provided through Appliance University Association (AUA), in partnership with Technical Training Associates, to bring hands-on training classes and certifications to servicers and businesses in the industry. Technicians who complete the training and pass the evaluations related to the programs will be awarded a certification. The examinations, evaluations, and documentation of certification are accomplished under the auspices of Technical Training Associates. Will a service technician need farther certification? See: Introduction to Appliance Repair Education, Career Guide for Home Appliance Repairman, With Training Requirements Information. The United States Environmental Protection Agency (EPA) regulations require technicians that maintain, repair, or service stationary air-conditioning and refrigeration equipment to obtain certification. EPA Refrigerant Recovery Certification credentials do not expire. Do I get a certificate when finising the course? Yes! A certificate is awarded at the end of the five classes, after passing the final test. Does Appliance University produce many training tutorial vidoes for newer and older designed appliances? Education starts in small increments. To quote an AU customer, "I learned a lot from watching the video". Manufacturers do not change the basic design for 25 - 50 years. A few AU training tutorials are for dryer models manufactured from the 70's - 2000. Millions of this designed dryer are still being used, and in need of repair. Once repaired, they will last just as long, in fact better than newer dryers which seem to have more problems because of newer electronics built into them. So there is money to be made repairing these older dyers. What do the videos cover in the tutorials? These videos are comprehensive training programs which give specific service procedures for major appliances. They take you step by step through the design, operation, and specific repair procedures. Learn how to diagnose a motor that will not run, and learn how to disassemble components. These videos cover safety, theory, operation, and troubleshooting, so skills can be upgraded. How are the DVD tutorials priced? Appliance University DVD courses are a 10th of the cost of a one day workshop or semester length course for one technician, not to mention the expence of travel, and accommodation. And once the video is part of a company’s library, it can viewed whenever it's convenient over and over again. Training tutorial video's starting price is $39.95. Newer model tutorials are priced from $99.95 to $149.95-see AU newer designed dryers. Yes! See Libraries and Bundle prices above (What is the difference between the library bundles?) *Click on bundle sets below. Will the DVDS play on my Laptop or desktop? Yes, if the Laptop has a DVD player. If computer only has a CD player, it might not play. Not all Laptops or desktop computers are formatted to play DVDs. AU does not guarantee that the DVDs will play on all computers; the problem might be the computer, not the DVD. Can I pay by installment plan? Yes! By buying one tutorial at a time. Purchasing this way will be more expensive, not counting shipping cost. Do the tutorials have a warranty? Yes! Satisfaction is Guaranteed in viewing videos to be free from damage or defect, please contact us for a replacement within 10 days. Each DVD should be able to be viewed and listened to. AU's intention is to produce and deliver videos that will meet your viewing satisfaction. If you encounter any problem, first check and see if computer has a DVD player. Not all Laptops or desktop computers are formatted to play DVDs. AU does not guarantee that the DVDs will play on all computers; the problem might be the computer, not the DVD. Library bundles have a longer warranty due to the fact that there are so many videos included. AU does not expect the purchaser to view all of the videos in a short time (10 days), thus the bundles have a 90 days warranty, *see above. Can a customer exchange videos, if the wrong one was ordered? No exchanges with the exception of a defective video, in which case the video can be replaced. See: Shipping and return policy. Are the Tutorials up to date? Brand specific videos on are up to date for their design of model. Model upgrades are not included, because these usually do not change in their basic design. When manufacturers change their design completely, the new model will be called by a new model name such as Whirlpool Duet, and Maytag Neptune. We are constantly in contact with professionals and manufacturers to make sure you have timely and detailed information on appliances and equipment your customers are buying. What is the difference between tutorials listed in other categories? Nothing, they are the same, listed under different categories for SEO. Appliance University works with seasoned professionals. Jim Johnson is one of these to produce quality instructional books, videos, and training courses you need to do your job and keep your customers happy. What are AU Terms & Conditions? Appliance University produces many training tutorial videos for newer and older designed appliances. Education starts in small increments. To quote an AU customer, "I learned a lot from watching the video". Manufactures do not change the basic design for 25 - 50 years. A few AU training tutorials are for dryer models manufactured from the 70's - 2000. Millions of this designed dryer are still being used, and in need of repair. Once repaired, they will last just as long, in fact better than newer dryers which seem to have more problems because of newer electronics built into them. So there is money to be made repairing these older dyers. This training tutorial video is priced accordingly at $29.95 or lower. New model dryer tutorials are priced from $99.95 to $149.95-see AU newer designed dryers. Brand specific videos on are up to date for their design of model. Model upgrades are not included, because these usually do not change in their basic design. When manufacturers change their design completely, the new model will be called by a new model name such as Whirlpool Duet, and Maytag Neptune.